When B&B Newsstand owner Gayla Ivy arrived at the local shop on the southwest corner of Main Street and Roselawn Avenue earlier this year to find the east windows of her business had been shot out, she was obviously frustrated. But with the help of construction-worker-turned-artist Gentry Janey, Ivy decided to turn an act of vandalism into art. After the windows were destroyed, Ivy opted to board them up, as replacing them would have been too expensive. At that point, she and Janey began discussing what to do with the inside wall, and discussions eventually turned to the exterior, as well. Janey is using all sorts of mediums to make the southwestern scene come to life, including broken pieces of Dayton glass from the early 1900s and Pecos diamonds. 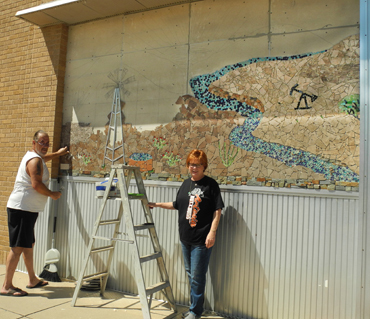 The mural is expected to be complete by the end of this week.